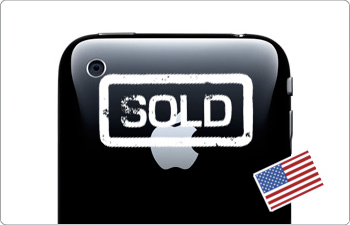 With the iPhone 3G not even ten days old, virtually all of the Apple retail store stores open within the United States are without any examples of the device to sell on July 21st. The shortage is severe enough in the 38 states that claim Apple stores that it's easier to count the locations that do have iPhone 3G units than those that don't. In California, the only Apple store with any iPhones is the Pleasanton store with only 16GB black examples, while New York City's Fifth Avenue store is the only one in all of New York state known to have any examples left, with just 16GB white models in stock. Only a single Honolulu store and the Salem, New Hampshire store can also claim to have any units available, and each only lists one model as ready for Monday. Apple has been continually resupplying its stores with new iPhones - in many cases on a daily basis - but has seen fewer and fewer of its stores touting next-day availability in the several days since the July 11th debut of the handset upgrade. Whether or not Apple's supply will meet demand in time to prevent a repeat of May's complete stockout is also far from certain. When grilled on an unprecedented spike in preorders, Britain's iPhone carrier O2 said it might take "some weeks" before it could satisfy enough of its customers on a regular basis.